Soon after I founded the Pacific Pinball Museum, an ex-police officer contacted me, offering to sell a rare artifact that was once confiscated by the Oakland Police force. The object in question was a Bally Bumper pinball machine from 1936. For many, this machine is the quintessential pinball experience. You launch a ball up a slanted table and try to get it to bounce off as many targets as it can before it drains back off. Bumper was the first machine to have electric targets that added points to your score when hit, and a totalizer that kept track of your score. Many people are stunned that pinball could ever have been considered gambling. However, if you play a couple of games on Bumper, which I quickly purchased from the police officer, you will see that even at a nickel a game, it’s horribly addictive and could quickly drain your pocket change. What really made pinball gambling was awarding a prize for reaching a high score. In 1931, America was introduced to coin operated pinball. Almost overnight, pinball machines began replacing trade stimulators, which were mechanical games of chance that awarded gum or a cigarette that were designed to lure people into businesses, so they might buy something. Pinball machines showed up everywhere—candy stores, bars, smoke shops—and many forms of award were given as prizes: cigars, free drinks, game credits, and of course, money. The payout didn’t happen like a slot machine. Instead, the proprietor of the establishment would handle the awards. Even if the card on the machine said “FOR AMUSEMENT ONLY!” everyone knew the storekeeper would pay up. With Prohibition winding down, organized crime was eager to take on pinball as a more acceptable alternative to the highly illegal slot machines of the day. It was a cash business, and it was a good one. For almost 30 straight years, pinball made more money than the entire motion picture industry. To the public of the 1930s, it was a welcome escape from the dismal economic climate and offered a chance of instant redemption. Nationwide demand was so high for pinball machines that companies could not keep up. During that time, over 150 manufacturers got into making the “marble games.” And it would be David Gottlieb’s 1931 Baffle Ball machine that cornered that market, as he developed an assembly line process for making the game. Despite manufacturing advances, demand was so high that Gottlieb soon was unable to meet his distributors’ requests. One of the frustrated distributors, Ray Maloney, decided to make his own machine, “Ballyhoo,” named after a popular gentleman’s humor magazine. The game was so successful, his company name—formerly known as Lion Mfg. Co.—was changed to Bally. Although all the manufacturers were cognizant of the gambling aspect of pinball, nobody pursued it as enthusiastically as Maloney, who allegedly developed ties to the Mafia. 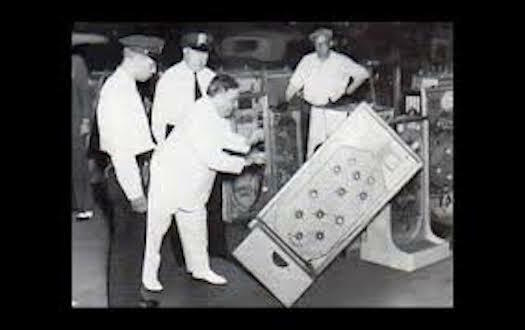 The most famous opponent of organized crime’s pinball racket was New York Mayor Fiorello LaGuardia. He had run on a ticket that opposed the corrupt Tammany Hall political machine and would serve for three terms, from 1934 to 1945. Living up to his promise to “Clean up New York City” he quickly declared war on slot machines. And after dumping thousands of confiscated devices into the Hudson from barges, he turned his attention to pinball. LaGuardia pushing over the Bally’s Bumper pinball machine. LaGuardia campaigned so relentlessly against pinball’s evils that it seemed like he had a personal vendetta against the game. He loved publicity, and posed for photos in which he wielded a sledgehammer, smashing the now illegal games amidst crowds of law officers. LaGuardia boasted that the hardwood legs from the machines were being fashioned into police billy clubs, perfect for beating the heads of the nefarious operators. Of the many pictures of the mayor posing with his “Sledgehammer of Decency” the one that really caught my eye was not obviously posed. Here, LaGuardia is seen pushing over a pinball machine that seemed strangely familiar. Upon closer inspection, and after comparing various photos, I concluded beyond a doubt that the machine in question was none other than my favorite game, Bally’s Bumper. In 1942, after the Japanese bombed Pearl Harbor, the New York mayor had his final victory over pinball. He argued that pinball was a misuse of precious resources needed for the war effort, and successfully lobbied the Federal Government to ban the making of pinball machines in America. After the war, pinball manufacturing was allowed to resume, but the game had lost much of its appeal because of its bad rap. Then, in 1947, pinball got a boost, thanks to the invention of the flipper, which was introduced by Gottlieb’s engineer Harry Mabs. Before the flipper was invented, the game was more akin to bagatelle, a French invention of the late 1700s, which was played with a cue stick; the concept was to shoot the ball up an incline and arch it over a barrier to attempt landing it in scoring pockets. Bagatelle and successor versions depended on the initial shooting of the ball. Before flippers, the player had no way to interact with the descending ball and thus it was much more a game of chance than skill. Ironically, LaGuardia died one month before the introduction of the flipper, which brought on another pinball craze. But LaGuardia’s legacy was so powerful that pinball remained banned in New York for nearly 30 more years. In 1976, responding to pressure from the industry, the New York City Council heard arguments about how the flipper had transformed pinball into a game of skill. The council chamber had two machines brought in and had a ringer come in and display how he could beat the game using his flipper skills. The ban was lifted and Gottlieb made a limited run of games re-titled “New York” to celebrate the decision. But the flipper’s invention did not stop Bally’s Ray Maloney from pushing a new design that would bring back the gambling aspect to pinball. Enter the Bingo pinball machine in the late 1940s. Early models were founded on the goal of getting the balls into certain holes for game credits, but that quickly evolved into a Bingo card format where the flipperless playfield was strewn with rubber ringed posts and 25 holes to catch the balls. The idea was to light three or more numbers in a row to get awarded credits. Whenever you see a pinball game that has a three-digit credit counter, you can safely assume it was designed for gambling. The way it worked was, if you racked up a significant amount of credits, you would tell the bartender or shopkeeper and he would cash you out by paying you for all the unused credits. The bartender or shopkeeper would then push a “knock off” button that would count down all the credits and zero the game for use by the next player. These machines were soon declared to be gambling. And in 1950 came the biggest single blow to pinball: the passage by Congress of the Johnson Act. That law banned interstate shipment of “gambling devices” (including repair parts, manuals, etc.) except to states in which the device was legal. So, it now was a federal offense to ship slot machines, “one-balls,” and pinball devices into any state which did not allow them. This should have been quite a deterrent to the manufacturers and distributors. But the game was too popular, and it thrived in the many states where machines were legal, and even those where they weren’t. Enforcement was uneven at best. In San Francisco, where pinball was never illegal, the Bingo games were singled out as unabashed games of chance that were draining men of their paychecks. But the police could not keep up with all the secret rooms and payola protecting the operators. Complaints from angry spouses eventually convinced the powers that be to declare that Bingo pinball machines had to be adapted to play only one game per coin. Players hated the decision but mostly surrendered; a few removing the modifications to make them play as originally intended. Every time I get a chance to play a game on my Bumper, I look up at the museum’s poster of Mayor LaGuardia toppling the game. And I take a deep breath, pull back the plunger, and thank my lucky stars that his sledgehammer did not come down on my precious machine. is the founder and CEO at the Pacific Pinball Museum in Alameda, California. *Photos courtesy of Michael Schiess.